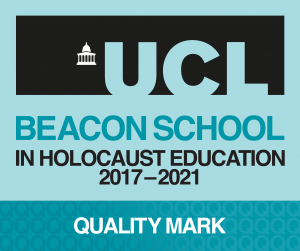 In July 2016 the Centre successfully launched its Beacon School Quality Mark programme recognising commitment to ongoing quality provision for and innovation in teaching and learning about the Holocaust. The quality mark enables us to champion best practice and continue the Centre’s and schools’ developmental partnerships beyond the Beacon School programme year. The review process is designed to include a survey of any related documentation, policies or data prior to the visit; with a subsequent one day visit including a tour of school, meetings with the Headteacher or SLT and lead teacher, a meeting with teaching colleagues across the school who have received specialist CPD and teach about the Holocaust, a student voice panel, an opportunity to see Holocaust teaching and learning in action and work scrutiny. During the Quality Mark visit we were shown a short film created by students and staff at Bishop Challoner, the video demonstrates how the CPD programme has been embedded by teachers, how students were reflecting on the stories they encountered and their sense of pride in being a UCL Beacon School for Holocaust education. We look forward to our other Beacon Schools taking up this exciting opportunity to recognise such excellent work in the future.